As a result you can’t say a thing! Sure enough, there are strategies such as PARAPHRASING, for example (trying to say it in different words) or speaking in SHORT SENTENCES which can be very successfully implemented when you can’t remember the exact word you’re looking for. I mean – why try and struggle to remember something you obviously can’t remember at the risk of not being able to say anything? Simply put it in different words, and let the conversation continue! Having said all that, however, I have to agree that you might still want to figure out WHY you forget English words and how to make sure such incidents don’t happen ALL THE TIME, am I not right? I’ve often wondered – and I’m sure it has also occurred to you at some stage – why don’t we possess the data processing abilities of a computer? Wouldn’t it be great if you could look up information in your brain just like when performing a Google search? If that were the case, we would rarely forget anything except for incidents resulting in brain trauma in which case the very brain cells containing the relevant information would get damaged, and we would ALWAYS know what English words to use! We’d only have to read a new English word once to remember it forever, and we’d always be able to look it up when necessary. Unfortunately (or maybe for a good reason?) our brain isn’t wired that way. We don’t memorize new words like a computer – we memorize CONTEXTUALLY. Maybe it isn’t the most effective way of information storage out there, but for survival purposes our human contextual brain works just fine. If a snake bites your fellow tribesman and he dies, the image of the snake associates with that of a dying man and that makes you stay away from it in the future! Same goes with any new information – new people’s faces, beautiful nature scenes or new English words – ANYTHING really! Any new info in our brain is always linked to some OTHER information, and we recall the new information through the associated bits of info. The new girl who just started working in your company? I bet you remember her face in conjunction with her hair, outfit and also the company settings. If you see her wearing totally different clothes and hairdo as well as in a completely unrelated setting, there’s a chance you won’t even recognize her! Houses opposite yours you see every time you look out the window? Believe it or not, but you probably wouldn’t recognize them if someone showed you a photo where they’re depicted – simply because you’re so used to seeing that particular scene through your window and your window frames and curtains are closely associated with the image of houses across the street. The very same way, certain English words are closely associated with others. Just take the phrase “closely associated with” – as you pronounce the word “closely” – “associated” comes out of your mouth by itself because these two English words often go together in speech and also writing. But what if the association isn’t that strong? What if you’ve never learned the words “closely” and “associated” together? Guess what – then you’d struggle to say this particular sentence, and that’s when you run into the problems of forgetting certain English words! Reason #1: You Haven’t Learned the Word Contextually! Let’s say, you look at a picture of a stapler in some vocabulary building software or smartphone application and you repeat the word “stapler” a number of times. Would you be able to use the word “stapler” in a phrase when asking someone to pass you a stapler in your new office job? Maybe yes, but possibly not – simply because you haven’t created any associations between that word and other English words in real life situations! All you have is an individual word “stapler”, but in times of need you may just as easily forget it because it’s not associated with other English words. Just think about what happens in an English class. You write a new English word “stapler” in a textbook. Maybe you even translate it into your native language WHICH IS TOTALLY WRONG because instead of not creating any contextual associations at all it does in fact create all the WRONG associations! Not only you won’t be able to remember the word “stapler” when you have to use it in real life, but you’ll also start getting your own native language words mixed in when trying to speak – which is the very worst of the possible English fluency issue manifestations. So How the Hell Do I Make Sure I Don’t Forget English Words? The simple answer is – learn them in CONTEXT. The English Harmony System de Luxe Edition is a software containing 100 speech exercising and meditation lessons, and it’s all based on contextual learning. If you’re serious about improving your spoken English and making sure you don’t forget English words, you should definitely check out the EH System! CONTEXT IS THE KING – I’ve repeated this mantra all over and over in my blog posts, and I’ll never stop sending this message out there. When you’ve learned an English word in context, your chances of remembering it when the right situation presents itself are much, much higher. Let’s say, you learned that an office device used to secure a number of sheets together is called “a stapler”. You constantly used the word in phrases such as “Does anyone know where the stapler is?” and “Can you hand me the stapler, please?”, and you also saw the stapler a thousand times in various office locations so the word “stapler” has been imprinted in your mind along with various phrases and also mental images. You’d know the word “stapler” instinctively even when in a completely different office environment and stressed out of your head! 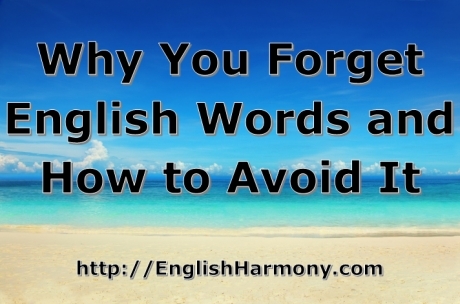 Best Piece of Advice: Don’t FORCE Yourself to Remember a Specific Word! Sometimes we just can’t remember a specific English word despite knowing deep down inside that we KNOW what we want to say. Just the other day I was talking to my workmate about various Hollywood movies and the respective actors – and all of a sudden I couldn’t remember a famous actor’s name – and to my surprise, my work collage couldn’t remember it either! It was as if both of us had had some sort of a brain malfunction at the same time. I’m pretty sure you’re familiar with the same feeling, and I’m also quite sure that you know the best cure for it. Stop trying to remember it. The more you keep straining your brain to remember it, the more the word is going to evade you. It’s like some sort of a reverse psychology is at play, and the moment you stop doing it, it just comes back to you. That way you’ll build a solid network of vo.abulary associations in your brain, and your ability to speak in English like a native English speaker will increase rapidly! The English Harmony System software that I created myself does a very good job at that, by the way – so if you want to re-wire your English vocabulary which is acquired over the years by following the wrong methods – EH System is the way to go! Thanks for reading my friends, and if you’ve any questions whatsoever, please publish them in the comments section below. Good article! Very well written and useful tips on remembering English words. Just wanted to say that this doesn’t just effect foreign English speakers. I’m a native English speak but I’ve been living in Japan for the last 5 years and my English has deteriorated atrociously. I speak only Japanese in Japan and when I do speak in English, the conversation is normally in broken English or Japanglish. Overall I believe there are many factors in which why my English fluency has decreased. However I dont think it matters much as long as you can communicate what you want to convey. It’s okay to make mistakes and it’s okay to not remember everything – even native speakers have difficulty remembering everything single word out there. It is SO frustrating! And the funny things is that I feel much more comfortable speaking, reading and writing in English than in my native language to the point where English is becoming my first language. Well, I can definitely tell you’ve been reading my blog and you have the basic principles covered in your comment, keep up the good work! 1 point – You need to learn much more contextual phrases and write them down int your copybook. 2 point – Speak with yourself as often as you can, you have to be talking with yourself each another day within 3 months, and ultimately find out how fluent you have become at the end. 3 point – Read english books or loads of various english topics. 4 point – Avoid a long conversations in your native language, make a permanent stress on english-thinking!